According to a Pew Research Center poll released January 11, two-thirds of Americans now believe there are “very strong” or “strong” class conflicts in their country—a marked increase from 2009. The Occupy movement is both a cause and a beneficiary of that change, if it can make the most of it. There is no need to start from scratch. 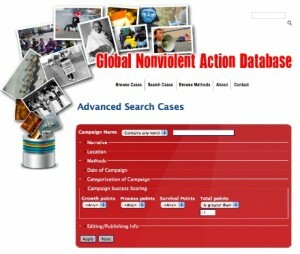 As the movement reflects on last fall and prepares for spring, the Global Nonviolent Action Database (GNAD) is becoming an ever more valuable resource. Since its release on the web in September, the database has surged to more than 530 cases of nonviolent direct action campaigns, available at no charge to activists and researchers everywhere. The GNAD draws on people’s struggles from over 190 countries, and goes back in history as far as 12th century BCE Egypt. Most are from the 20th and 21st century. The student researchers from Swarthmore College—aided by students at Georgetown and Tufts—have found far more cases than they’ve had time to write up so far. A hundred additional cases are underway. While many of the campaigns have used the “occupation” method in their struggle—77, in countries including Kenya, Mongolia, Paraguay, Brazil, Germany, England, and Chile—campaigners have used dozens of other methods as well. As the Occupy movement grows to encompass a wider range of tactics, from eviction blockades to strikes and boycotts, the GNAD can help organizers learn from past experiences. Over two hundred of the database’s cases involve campaigners who are seeking economic justice. In Sweden, for example, the political power of the wealthiest—that country’s own “1 percent”—was undermined by a mass nonviolent struggle in the 1920s; when the 1 percent resorted to ordering troops to shoot workers in 1931, protests surged even more and the Social Democrats took over the leadership of the country, bringing a truer democracy and the redistribution of resources that today is the envy of most of the world. There are older campaigns for economic justice in the database. The first strike in the U.S., for example, was in colonial Jamestown, Virginia—somehow not included in Disney’s Pocahantas! It also includes much more recent examples, such as last year’s victories in Bolivia, Jordan and Oman. A virtue of the database for strategizing is that all the published cases cover complete campaigns; they’ve reached a conclusion—win, lose or draw. The reader can therefore more easily take lessons from them, seeing how certain choices led to certain outcomes. In addition, all sources are cited, so readers can delve more deeply into any particular case to learn more about it. We’re already hearing back from activists about how the database is expanding their ideas of what is possible. It builds, in fact, on scholar Gene Sharp’s famous taxonomy of 198 nonviolent methods of struggle—it has already added a 199th method to his list! We’re also always looking for more cases that are not yet in the database; if you know of one that you don’t find after conducting a search, please write to me at glakey1@swarthmore.edu. The secret lies in unity. How do you get to unite all sorts of varied expressions of grievances and channel them into one force, able to create change. repeace.com was launched this past week in beta testing and with good arguments claims that this world uprising is the true movement inspired by peace, which has the unifying elements of people wanting to hold accountable and control their institutions run amok. A shift in thinking about peace and how to achieve it is laid out in the main articles and vision.